Susanne is the handler for three currently registered therapy dogs, and though she’s had others as well, Rocky was the first she adopted as a puppy. 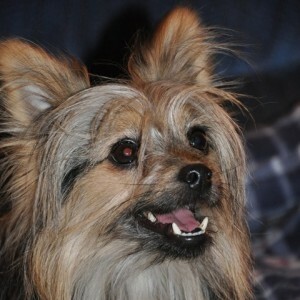 He is a Pomeranian/Yorkie cross that found a home with Susanne through Animal Humane Society. Rocky loves everyone he meets and, according to Susanne, believes everyone he sees wants very much to pet him. Susanne & Rocky visit as a North Star Therapy Animals team at the Ronald McDonald House – Twin Cities and hope to also work as a Reading Education Assistance Dogs (R.E.A.D.) team. Rocky loves stuffed balls and will retrieve them as long as Susanne is willing to continue throwing them. Additionally, Susanne & Rocky enjoy participating in agility classes together, and the team hopes to compete in the future.